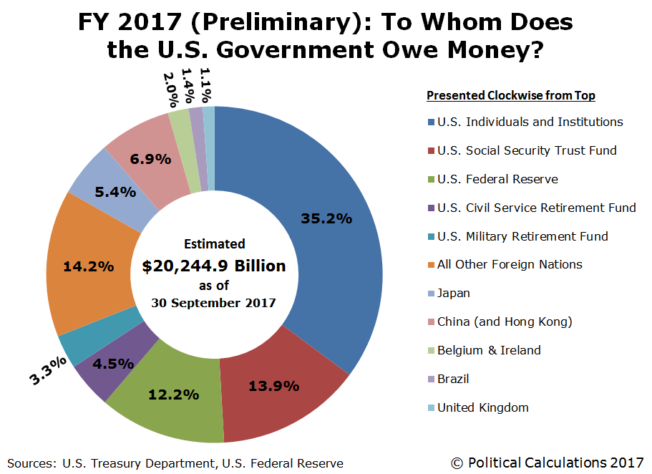 Who Lent $20 Trillion to the U.S. Government? The U.S. government’s 2017 fiscal year officially ended on 30 September 2017. From the end of its 2016 fiscal year (FY2016) a year earlier, the total public debt outstanding of the U.S. government increased by $671.5 billion, rising from $19,573 billion (or $19.6 trillion) to $20,245 billion (or $20.2 trillion) during FY2017. According to the U.S. Treasury Department, the U.S. government spent some $665.7 billion more than it collected in taxes during its 2017 fiscal year. The difference between this figure and the $671.5 billion that the total national debt actually rose can be attributed to the government’s net borrowing to fund things like Federal Direct Student Loans, which collectively account for nearly $1.1 trillion of the government’s $20.2 trillion debt, or 5.4% of the total public debt outstanding. Put differently, the U.S. national debt would be 5.4% less at roughly $19.1 trillion if not for the federal government’s takeover of the student loan industry from the private sector in March 2010. Since that time, approximately $1 of every $10 that the U.S. government has borrowed has been for the purpose of funding its student loan program. Overall, 69% of the U.S. government’s total public debt outstanding is held by U.S. individuals and institutions, while 31% is held by foreign entities. China has resumed its position as the top foreign holder of U.S. government-issued debt, with directly accounting for 6.9% between institutions on the Chinese mainland and Hong Kong. Beyond that, China likely has additional holdings that are currently being shown as being held in the international banking centers of Belgium and Ireland, which together account for 2.0% of the U.S. national debt, where China’s holdings are believed to represent a significant portion of the amounts currently being credited to both these nations. The largest single institution holding U.S. government-issued debt is Social Security’s Old Age and Survivors Insurance Trust Fund, which is considered to be an “Intragovernmental” holder of the U.S. national debt, and which holds 13.9% of the nation’s total public debt outstanding. The share of the national debt held by Social Security’s main trust fund is expected to fall as that government agency cashes out its holdings to pay promised levels of Social Security benefits, where its account is expected to be fully depleted in just 17 years. Under current law, after Social Security’s trust fund runs out of money in 2034, all Social Security benefits would be reduced by 23% according to the agency’s projections. 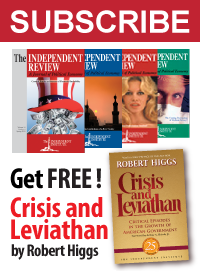 The largest “private” institution that has loaned money to the U.S. government is the U.S. Federal Reserve, which accounts for nearly one out of every eight dollars borrowed by the U.S. government. It lent nearly all of that total since 2008, mainly through the various quantitative easing programs it operated from 2009 through 2015 in its attempt to stimulate the U.S. economy enough to keep it from falling back into recession. In September 2017, the Fed announced that it would begin reducing its holdings of U.S. government-issued debt. 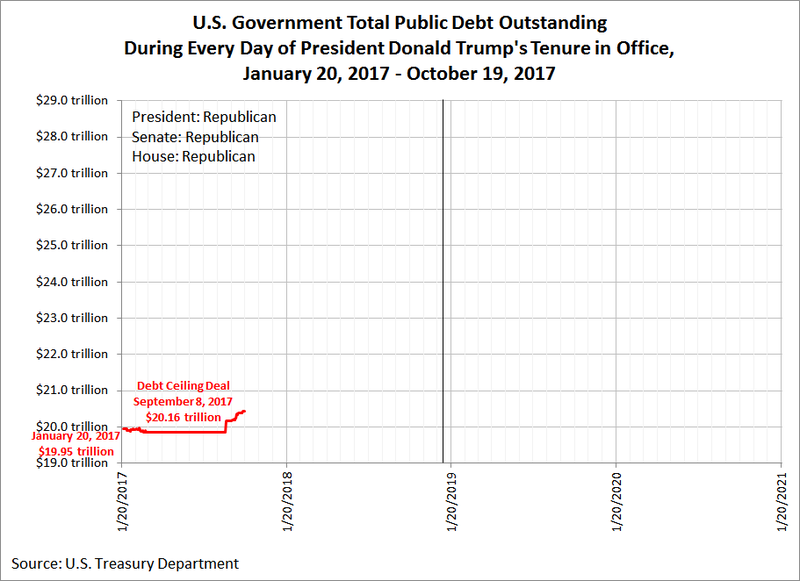 An important question to ask is “how fast is the national debt accumulating?” To find out, we pulled data from the U.S. Treasury Department, where we find that since being sworn into office nine months ago, the U.S. government’s total public debt outstanding has increased by nearly $484 billion. By contrast, during President Obama’s first nine months in office, the U.S. national debt increased by nearly $1,326 billion (or $1.326 trillion), about 2.7 times the rate under President Trump. During President Obama’s last nine months in office, the U.S. national debt increased by nearly $732 billion, one and a half times faster than the rate seen during President Trump’s first nine months in office. The observation we’re making here is that it is the rate at which the national debt is increasing that most affects the behavior of politicians. Under President Obama, that rate was viewed as unacceptable in his first years in office, which resulted in President Obama’s party losing control of the U.S. Congress. That event, more than any other, did more to slow the growth of the U.S. national debt during the rest of President Obama’s tenure in office, where presumably, by the end of that tenure, most politicians were comfortable with the rate at which the U.S. national debt was growing. 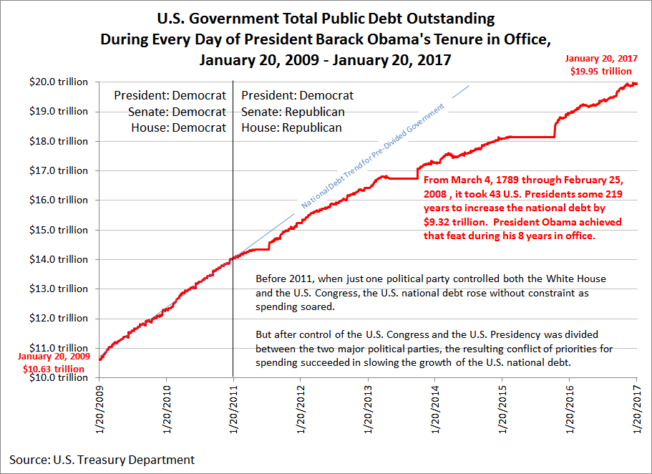 Now in 2017, the rate at which the U.S. national debt is increasing is slower than at any time outside of periods where it ran into the national debt ceiling during President Obama’s occupancy of the oval office. Politicians of both major political parties who came to be comfortable with that rate of national debt growth now see opportunities to both reduce taxes and to allow higher levels of spending, which would increase the rate at which the national debt is growing today. Perhaps a better question to ask is whether those same politicians should be so comfortable with that point of view?